In an exclusive interview, Stephanie Jacoby, the woman behind the controversial Jane Walker, explains why the new whisky was never designed specifically for women, and how its intention has been misunderstood. Earlier this week news emerged that Johnnie Walker was to get a sister, a limited edition blended Scotch whisky named Jane Walker. The new Jane Walker Edition, being launched across the US in March, is the first whisky to feature a female iteration of the brand’s iconic Striding Man logo in its 200-year history. The introduction of the Jane Walker Edition was described by Johnnie Walker maker Diageo as ‘another symbol of the brand’s commitment to progress’, and a statement of its support for female empowerment causes, with $1 from every bottle produced donated to charities. With gender equality a topical issue, particularly in the lead up to International Women’s Day on 8 March, Jane Walker’s introduction has divided opinion, inspiring fans of Johnnie Walker, female whisky drinkers and feminists alike to express their thoughts on social media in a scene that mirrored the backlash against the launch of ‘Lady Doritos’ last month. ‘Get a grip ... this isn't progress by any stretch of the imagination ... whisky is whisky ... we don't need wee girlie names or labels,’ @lynnslkcmoore tweeted. ‘To be consumed with lady Doritos, whilst sitting on a lady chair, in a lady room, which is part of a lady house, in a lady city, on a lady planet. #pass #missingthepoint,’ said Outlander actress Caitriona Balfe on Twitter. ‘I like what they've done. It's the same whiskey – just a diff label and a part of proceeds go to programs supporting women. It's just a cool gesture,’ wrote @womnseeknwhisky in a tweet. What was intended as a symbol of unity with the gender equality movement appeared to backfire on the brand, with the expression even taking a beating by Stephen Colbert on CBS’ The Late Show. However, in an exclusive interview with Scotchwhisky.com, Jacoby – the woman behind Jane Walker – claims the distiller’s intent has been widely misunderstood. Do you really believe women are intimidated by whisky? So you believe whisky is difficult to understand regardless of gender? Where did the idea for Jane Walker come from? ‘The inspiration came from this idea of the role of female icons in culture. In the US women are thoroughly underrepresented in terms of statues in parks. You look at brand icons, and you don’t see a lot of women represented. There was actually an article I read in the New York Times called “Why we should put women on pedestals”, and that’s how we found Monumental Women, which is one of our partners in this. It’s also how we crystallise the power of taking a century-old icon in our Striding Man and reimagining that icon as a woman, and of course that’s Jane Walker. For us, the thought was a powerful statement in terms of the iconography of the brand. Why name it Jane Walker? Why not name it after one of your female blenders or important women in the brand’s history like Elizabeth Cummings who ran Cardhu? ‘In terms of naming her Jane, we thought Jane was a timeless name, so for a brand that’s been around for a few hundred years that felt appropriate, and Jane is also a name that represents every woman. Do you think Jane Walker has been misunderstood by consumers? ‘It’s funny, we launched knowing that it could lead some debate. Any time you have such an iconic brand you’re always subject to intense scrutiny. Overall the response has been overwhelmingly positive, and it’s great to see people are taking the campaign in the positive spirit it was intended. We’re seeing more and more of that, though I think maybe there was an initial kneejerk reaction. 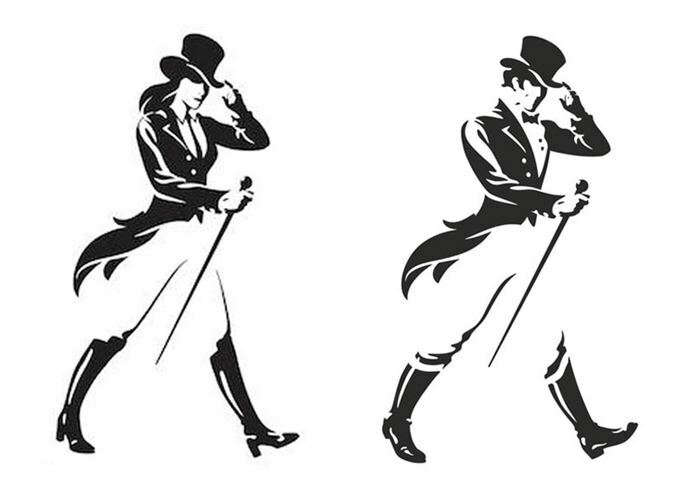 A female version of Johnnie Walker’s Striding Man will grace bottles in the US. The Striding Man has been transformed into the Striding Woman for a new whisky edition.